AUSTIN, TEXAS, and OYSTER BAY, NY--(Marketwired - Apr 21, 2015) - Wi-Fi Alliance® and ABI Research announced today that the use of dual-band Wi-Fi® devices has surpassed that of single-band 2.4 GHz devices only. Widespread adoption of Wi-Fi CERTIFIED™ ac in smartphones, tablets, and consumer electronics has pushed 5 GHz into the spotlight as a critical frequency band for Wi-Fi operation, today and into the future. Wi-Fi CERTIFIED ac is the latest generation of Wi-Fi, offering users expanded bandwidth and up to gigabit per second data rates, with dual-band usage doubling overall network capacity. Wi-Fi CERTIFIED ac has prompted the expansion of 5 GHz Wi-Fi usage beyond the enterprise, as consumers adopt advanced smartphones and look to dual-band networking to improve home network capacity and performance to support multimedia usages. "The advancements in 5 GHz Wi-Fi technology have fueled the growth in the number and variety of devices certified by Wi-Fi Alliance members," said Edgar Figueroa, president and CEO of Wi-Fi Alliance. "The widespread use of 5 GHz Wi-Fi products continues to increase the value of Wi-Fi, with better performance and capacity." According to a new report by ABI Research, 68 percent of all Wi-Fi devices shipped in 2015 will use the 5 GHz band. "The growth of Wi-Fi devices has been consistent over a number of years and has shown an ever-expanding presence in 5 GHz," said research director Phil Solis, ABI Research. "More than half of all Wi-Fi devices last year used 5 GHz, and that will grow to close to 100 percent saturation in the next five years." 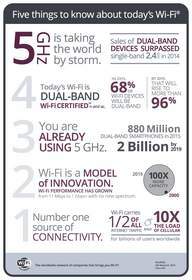 Download the free ABI report 5 GHz Wi-Fi is Now Mainstream and Wi-Fi Alliance infographic. Please visit www.wi-fi.org for more information on Wi-Fi CERTIFIED ac and other Wi-Fi Alliance technologies and certification programs. Wi-Fi Alliance® is a global non-profit industry association -- our members are the worldwide network of companies that brings you Wi-Fi®. The members of our collaboration forum come from across the Wi-Fi ecosystem and share a common vision of connecting everyone and everything, everywhere. Since 2000, the Wi-Fi CERTIFIED™ seal of approval designates products with proven interoperability, industry-standard security protections, and the latest technology. Wi-Fi Alliance has certified more than 25,000 products, delivering the best user experience and encouraging the expanded use of Wi-Fi products and services in new and established markets. Today, billions of Wi-Fi products carry a significant portion of the world's data traffic in an ever-expanding variety of applications.